Extraterrestrial aliens land in Los Angeles and humans battle them. 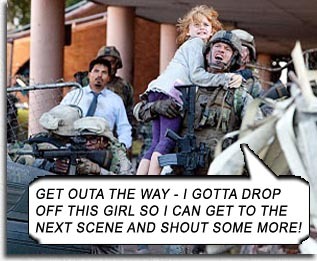 That’s why it’s called BATTLE LOS ANGELES. Creative. Filled brim to barrel bottom with explosions, running, army jargon, and characters we care about just slightly more than the assholes on JERSEY SHORE. It’s as if SAVING PRIVATE RYAN were directed by someone with all the tools but none of the heart of a Spielberg. So cute how movie takes its time introducing all the soldiers involved in the battle with a title card, stating their name and rank, as they go about their soldierly day before the fracas begins: one retiring, one with pregnant wife, one getting married, one visiting his brother’s grave, one in psychiatric session, one with his soldier boy mates, one a virgin, one newbie officer… We don’t care. Though the aliens are landing all over Earth, the movie focuses only on Aaron Eckhart leading one squad of green soldiers in an attempt to evacuate Santa Monica before the army nukes it. Pathetic attempts at camaraderie, storyline, plot and especially characterization: there’s the new lieutenant blankly wondering how to lead; the guy breaking down “They’re all gone! They’re all gone”; the guy that says, “Get ahold of yourself!”; the retiring soldier pulled back in for one last battle (Eckhart); the arc of Eckhart’s troop hating him for getting his last squad killed and the teary-eyed reconciliation as he tells them all those dead men are burned into his memory and starts reciting their names and dog tag numbers… Like we care. Just when we think it can’t get more boring and witless, they find a wounded alien and try to figure out where its heart is by stabbing it everywhere. That would be nice if you were sharpshooting from a bell tower, but you’re pumping giant-caliber ammo and rocket grenades into these things. Does it really matter their most vital organ is “to the right of the heart area”? Does anyone care? Pick up civilians Bridget Moynahan and Michael Peña and some kids – devices to protect from enemy fire and make the troops more vulnerable. That’s if we CARED about Pena and Bridget and kids staying alive. Michael Pena dies just to get out of the movie. Eckhart draws fire away from the squad and destroys an alien craft – makes Bridget Moynahan wet between the thighs. Speaking of which, Michelle Rodriguez is here as a girl-soldier, but she forgot her battle gear, which is a halter top and bare midriff, so she’s clinically useless. The mothership looks suspiciously like the DISTRICT 9 design. But there’s no confusing that classic movie with this dreck that serves no purpose whatsoever. This movie is literally so shallow that once we find out the aliens are apparently here for Earth’s water, that’s the end of their backstory or connection to anything regarding scientific interest, ancient legends about visitations, or military coverups. The news reporters don’t even seem too amazed that they’re reporting on actual extraterrestrials – we hear more energy from newscasters when mongoloid Sarah Palin writes a Twitter message. Somebody should burn every DVD and BluRay copy of BATTLE LOS ANGELES, incinerate the original reels, and arrest the writer and director for being bland and lifeless like their movie. I bet if you stabbed them all over their bodies you won’t find a heart. Starring: Aaron Eckhart, Ramon Rodriguez, Will Rothhaar, Cory Hardrict, Jim Parrack, Gino Anthony Pesi, Ne-Yo, James Hiroyuki Liao, Noel Fisher, Bridget Moynahan, Adetokumboh M’Cormack, Bryce Cass, Michael Peña, Michelle Rodriguez.